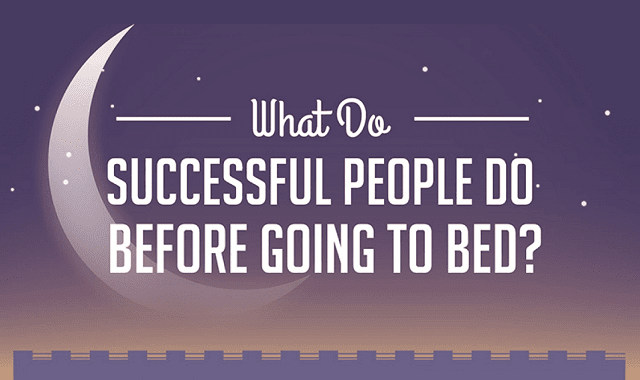 What Do Successful People Do Before Going To Bed? #Infographic ~ Visualistan '+g+"
If you struggle to get a great night's sleep, have you ever stopped to think about how your bedtime routine may affect this? SleepyPeople.com recently took a look at how some of the world's most successful people conduct their pre-bedtime routines and, surprisingly, there's no one common approach! From the likes of Bill Gates who loves to read biographies before getting his head down to Arianna Huffington who bans all electronic devices from the bedroom; it's interesting to see the difference between the routines of different individuals. All in all, it goes to show that bedtime routines are unique to the individual but that, in many ways, it shapes who you are as a person. If you struggle to get a great night's sleep, spend a few night's experimenting. Does banning tech from the bedroom help you to get a better night's sleep? Does reading a book help you to relax? How about taking a long bath? Give a few different things a try and before you know it, you'll be sleeping like a baby each night!